alisaburke: a new class and a GIVEAWAY TODAY! 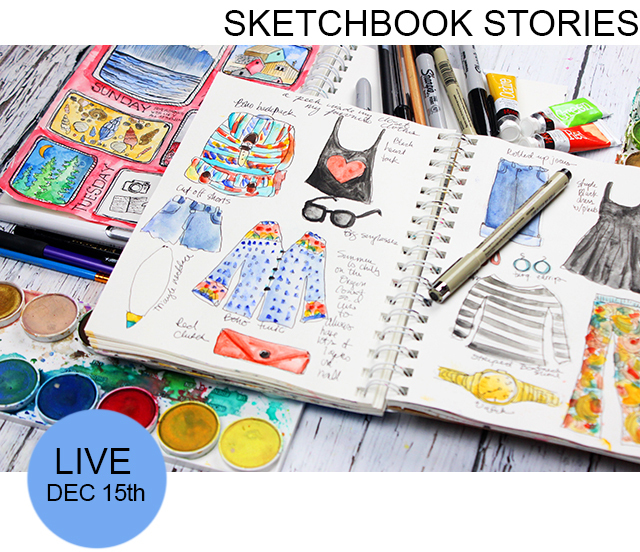 My nest class Sketchbook Stories goes live on Tuesday, December 15th. And today I am giving away 10 free spots to this class! Scroll all the way to the bottom of this post to enter to win. I've also got a little pop up sale on this class that will run until Sunday- take $10 off Sketchbook Stories. As many of you know, drawing and sketching is a really important part of my creative process. I believe that regardless of your experience, drawing is a wonderful way to stay inspired. In this class we will be using basic drawing and sketching concepts as a way to capture a moment, document ideas and tell a story. I will be sharing prompts, techniques and ways to turn your sketchbook into a diary! 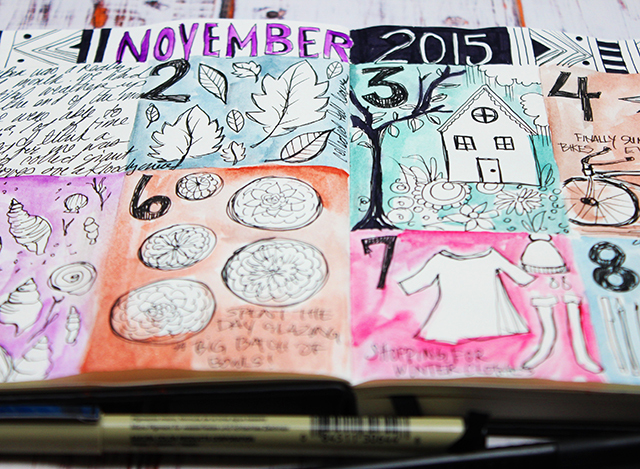 ENTER TO WIN A FREE SPOT IN SKETCHBOOK STORIES! I will randomly select 10 winners and announce them in this post on Sunday. Nature bits and pieces are my fab! Lately been working on flowers! Went on a walk today with the dog and there are tons of leaves finally all over the ground! I picked a few up and sketched them earlier! That was fun! I like to draw clothes, flowers, leaves and lettering. My favorite drawing themes are our two cats and our Flemish giant and sugar skulls! Thanks a lot. I enjoy very much your classes. My favorite are flowers, and themes related to nature. My favorite things to draw are flowers, mandalas and whimsical girls. I haven't drawn a lot yet. When I do, I mostly try simple animal shapes or flowers. I love to draw mandalas and flowers!! But I'm exercising my drawing skils of other objects, witch is more dificult for me!!! This will be an awesome class again. I draw very different things. From flowers to animals, cartoon kids, houses and landscapes, doodles and mandalas. And at the moment little robots for my 14 weeks old son. Art journals and stories aren't part of my portfolio yet. i really love to draw girls! Alisa, I like to draw mandalas and flowers, lately started drawing some birds !! Hi Alisa, I love to draw flowers, leaves, trees and patterns. This class sounds awesome. Des croquis magnifiques et remplis d'une belle âme. It would have to be anything from nature including plants, flowers, insects, birds and feathers ..always lots of feathers left for me in the garden. Patterns and doodles are fun too. 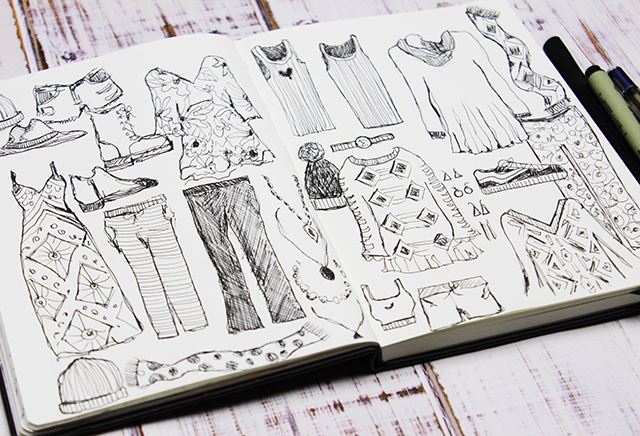 Patterns is what I love drawing most! I like to draw food. It's a way to draw natural objects aside from flowers and leaves. I'm looking for my 'own style', something whimsy! So I need to practice a lot. I love animals, nature, flowers,... Drawing & sketching makes me so happy, it's so relaxing! Fingers crossed!!! I love to draw stones and shells, flowers, pretty china and architectural details. This class sounds awesome! I like to draw anything in nature. Hi, I like to draw flowers, animals,and I love trying new techniques as I am ispired. Flowers are my favorite things to draw! I find that I love geometrics - shapes & lines that can be repeated over and over to create a design whole. right now i draw a lot of blobs and doodles but would like to spend more time drawing things.most of the blobs turn into flowers. 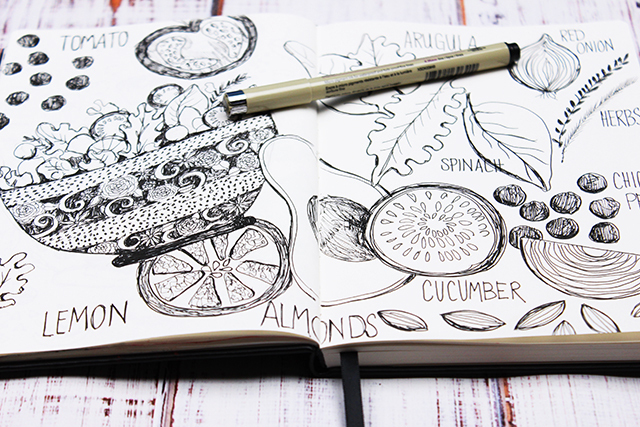 My favorite sketching themes are flowers, trees, fruits and veggies, birds aND sea creatures. I also have a desire to learn to sketch buildings and vehicles. Hi Alisa, I follow you from Argentina! I like drawing things that I find in my home and the flowers in my garden. I love to doodle in the margins, but sketching from nature is also a favorite. Class looks fantastic! I´m not drawing a lot yet to be honest. I bought a little notebook and want to draw one page a day from january first with just the daily things. Love your work, gives me much inspiration. I love to draw flowers. I love to draw stones and seashells. Thanks for the chance to win a spot! I love to draw animals!! Sounds like a fun class! My favorites are flowers and trees. I love to draw although I am a bit afraid to do it, because I think I can't. Everything in nature is perfect for a drawing. Practice makes perfect, isn't it? I love your work. Very inspiring. I love drawing just about anything but seem to gravitate to plants, leaves, flowers, or anything from the garden. Sounds like another fun class! I like to draw flowers and clothes and am trying to learn how to draw faces. Looks like a fun class! 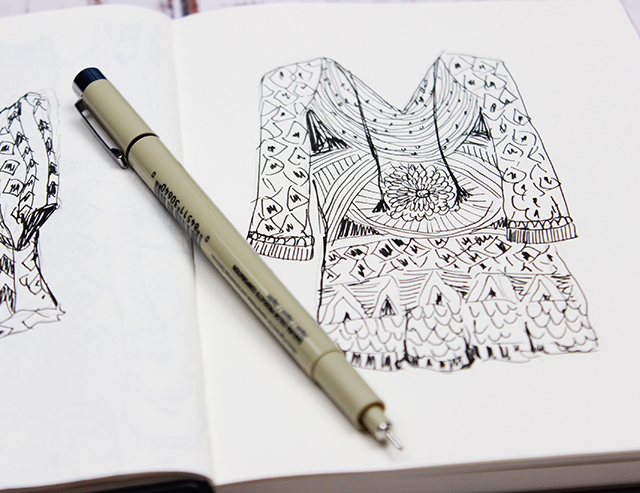 I love to zentangle. But also love sketching flowers. My favorite things to draw are flowers, birds, and animals. Looks like such a fun class! But i'd love to draw food as great as you do. 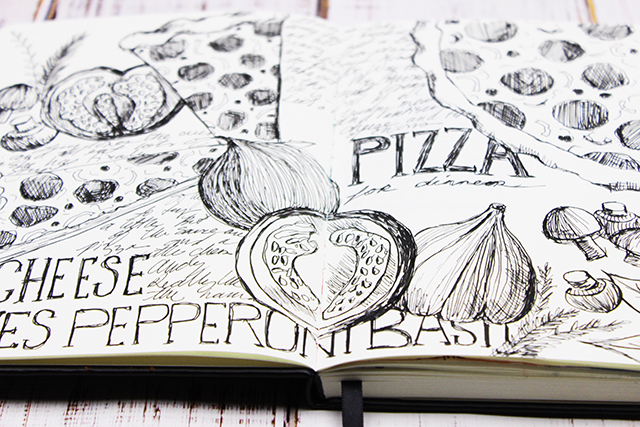 I've become hungry by just looking at your drawins. I love to draw flowers and patterns. I also like to draw the things around me. I love to draw flowers and mandalas! Happy holidays! My favorite theme is plain everyday objects we encounter so often we sometimes don't really appreciate. Thank you for sharing your talents and inspiring us all! Mushrooms r fun shapes. And veggies, and flowers. I like to draw whatever inspires me. A lot of times it's simple things around the house: fruit, flowers, etc. I also love to try my hand at some animals and my favorite so far are horses. My favorite thing to draw is random little things I see in everyday life in a new fun way. Thanks for offering this great giveaway! Flora, fauna and fairies! Thanks for offering this giveaway! I love to draw people and animals, and I need to get back into sketching for fun. The class looks great!! Flowers, leaves, and more flowers. :) Thanks for the giveaway! Nature - mostly flowers and leaves and geometrical doodles! Thank you for the fantastic giveaway! I love to draw everything! I stick to flowers and geometric shapes. I love the escape from the everyday that can happen while creating art! I love to draw flowers and funky little kids. Thank you for the generous giveaway! I enjoy creating whimsical things, such as flowers, trees, clouds, characters and random doodles, just to name a few. I don't take the time to draw, but would like to! Vines with a zentangle kind of feel are fun to draw, but I really yearn to draw the everyday things around me. I need more practice at that. Please enter me in the draw, I would love to take your class. My favourite thing to draw is flowers. Merry Christmas. Hi Alisa, Thank you for all the inspiration you share on your daily blog. I'm a loyal reader and try new things because of what you share. When on a trip, I enjoy taking a few moments to make a small drawing of whatever we have been experiencing as a family, be that a cake, a waterfall or some nice flowers. I love drawing nature and flowers. I like to draw faces and lately I did start drawing from all nice interior pictures that are coming in to my email. I would usually forget about them, but now that I did start redrawing them in a sketchbook they are always there. I love it. I signed up for this class back in September, so I'm super excited for it to start soon! I try to do something in my sketchbook everyday, so this class will be very helpful. Lately my favorite things to draw have been flowers from my weekly bouquets and animals. I love to draw leaves and street lamps. I love to draw anything from nature, but especially mushrooms! I am lacking drawing skills and would love to learn some tips and techniques. How wonderful!! I love your classes!! I am not very good at it....but my recent obsession is drawing faces. I enjoy drawing flowers and building scapes. I also enjoy your classes they are top notch. My drawing skills are rudimentary, but I'm learning and enjoy drawing flowers, mandalas, shells, and attempt faces. Would love to win a place in your class. I love drawing flowers and birds. Currently drawing flowers, mandalas, and patterns in small bits of time. How generous of you! My favorite things to draw are people! So much fun, thanks for the chance! Thank you!! I love to draw my dog and shoes! This is very generous of you. My favorite things to draw are paper dolls, but when I'm just doodling for fun than it tends to be shoes, lips and eyes. I like to draw food - YUM!! My favorite thing to draw is fashion illustration and beautiful, dramatic dresses! I love to draw plants,leaves,seashells and faces...sometimes all at once! I love to draw flowers and geometric shapes! I am an older person who is a new artist. I am learning to draw and so I try practicing anything and everything. People, flowers, food, nature, etc. I love to draw houses and faces. Thanks for the chance to win a spot in your class! I love to draw and paint botanicals. Right now I'm on a mandala and auraknot zentangle kick. Landscapes are my fav. Nature is a huge inspiration when it comes to my artwork. I love painting on the leaves as well. And seashells. I'm also a doodle addict. I'll doodle flowers, mandalas, and patterns are another favorite. I've always loved drawing women's faces. Thanks for the chance to win! I love to sketch florals and faces, sometimes together! I love to doodle flowers and faces. I really enjoy drawing what I call 'bits of nature.' A single petal with dew drops on it. An interesting rock. A cluster of berries. Anything micro. I love to draw my kiddos toys, pattern and natural elements, but don't currently have a lot of time to draw. Thank you Alyssa for being an inspiration to me as a mom, teacher and artist! I am amazed and in awe at how the two of you make art on a daily basis with your daughter. What a gift you are giving her! I am an artist and full time teacher and struggle to find time to create with 2 little children. I know in time it will come. Thank you for being so inspiring! I love drawing birds and women. I'd be so excited to win a spot in your class. Thanks for the generous opportunity. I like to draw things in nature and whimsical animals. I love to draw flowers, cats, and the things in my sketch kit- pens, pencils, etc. Flowers and birds and little houses. Still life, what ever is outside the window I am near! Make believe creatures are next on the list. People and all the little things that surround me. I love to draw flowers and food too! I am a doodler!! Doodles everywhere!! I can't help it...it relaxes me I guess!! Mostly abstract...paisley looking art. LOVE IT!!! I love to draw flower doodles and random geometric patterns. I find it very relaxing. Thank you for the opportunity to win a class. How cool! Flowers and leaves are my favorites. Faces and doodles. would love to draw more! Alisa, I would love this class. My favorite things to draw, (I'm a beginner), are flowers and patterns. Thanks for the opportunity. After being challenged to both draw more regularly and to draw non-usual subjects in another class, I am looking forward to another opportunity to push myself into more frequent drawing. I like to use nature for inspiration for drawing and other art work. I have not yet really gotten into art journaling, but would love to. I think I need a class for the motivation to get started. I like to draw flowers, geometric shapes, things that I buy and or consume (that has helped me immensely in a couple areas! ;) ) and fashion! Thanks for allowing us to see and join in your creative process! It has helped to open up mine. I love doing portraits and I also love to draw very stylized flowers. Right now my favorite thing to draw is abstract patterns and flowers. 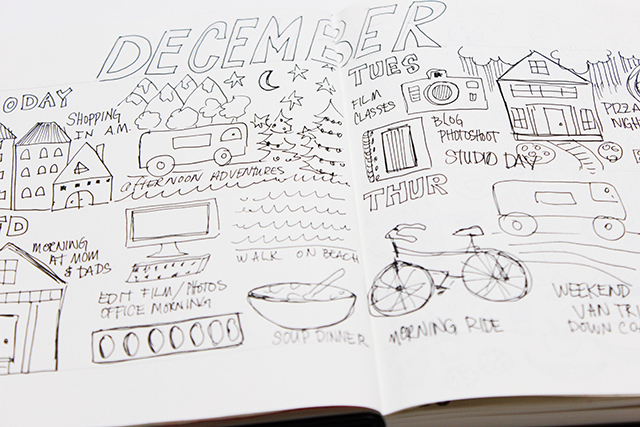 I have always wanted to keep a journal but I have problems with ideas and creativity and keeping it fresh. I wonder if you will make it this far down in the list! LOL I love to draw people and trees. I think they just go together so nicely. I also love to draw tangles to create beautiful Zentangle artwork! I wish you and your lovely family a wonderful winter! Thanks for letting me play! I like sketching my thoughts on paper, simple drawings, happy faces, symbols, words... when I'm planning something :0) I also like to draw with my son when we are working on his math story problems... and I love cats! I'm thankful for your blog, Mrs. Alisa, and your inspiration. i love to draw everyday things and I really wish I were better at it. Especially at adding variety because that's where I always get stuck :( Thank you for this opportunity! I am a doodler...mostly flowery - viney - things. I want to get better at all things drawing though. Thanks for the opportunity and inspiration. I love sketching flowers and would love to sketch more as a journal. I would love to learn from you how to creatively set up a page. Good day,would love to win this class. I mostly draw flowers and mandalas, mostly because they're so forgiving and it's a bit of a meditation process. Right now I am loving drawing hand lettering sketches. So much fun! Most of the time I am afraid of doing sketches...but with hand lettering I feel comfortable. Birds are a favorite subject of mine. I love to draw self-portraits, imagining myself in all the lovely places I want to travel! Flowers, faces and mandalas seem to be my go to. At the age of 48, I have only just now discovered the magical world of drawing and sketching! I can't say I have a favorite thing to draw yet because I'm drawing it all right now - whatever is in front of my face basically. My dog seems to be in front of my face a lot so I guess he's my favorite subject so far. Faces, flowers, hearts and leaves! I just love your classes! Thank you so much for this chance to win one!! Oooh...seeing your pizza sketch page and knowing where you live has brought up happy memories of Fultano's in Cannon Beach. Yum! I mostly doodle flowers, but when i get in the zone, it's about my cats. Flowers and birds and lately koi fish are my favorite things to draw for sure! Thanks for the chance to win! I love to draw trees and leaves. My favorite thing to draw is birds from photographs. What a cool class! I love to draw people, animals, florals, trees, anything really... Thanks for this opportunity! Oh I hope I am a winner!!! I love to draw flowers, trees and dishes!!! Fingers Crossed!! I like to draw anything: flowers, shells, tres, buildings, geométrica, doodling.. I love to draw flowers! Crossing my fingers! Anything from flowers, cats, teapots, geometrics! I like to doodle mostly. Not much of an artist. Would love to learn tho. Ohhhh i really hope to win! Mostly because i cant afford the course now. I like to doodle with flowers and sometimes copy the nature or whats around the house and garden! Since i have a veggie garden and summer holidays comming soon i will have time to sit around the plot and draw the fruits etc! oh my goodness, what to draw?! i am a terrible draw-er, but i do love drawing little circles and flowers...doodles really. what a sweet giveaway! I am learning botanical art - in watercolor. I so love to paint. Thanks for the giveaway!! My favourite things to draw are natural items that I play while on my walks at the beach or on the trails, such as shells, seaweed, driftwood, branches, berries, wild flowers, leaves and even nests and empty eggs. What a fun idea for a class, I just love your doodle style and would love to win a class...Thanks for the opportunity to enter! I love drawing women's faces and abstract designs and everyday objects. I love to draw flowers and anything in nature! So amazing! Flowers, circles and creating intricate designs. I hope I'm a winner! I like to draw houses. I love drawing hearts and some kinds of flowers. Thanks so much for the chance to win. You're a huge inspiration to my work along with my surroundings and my daughter. I love drawing faces and figures and I add flowers (from my garden) and things from my surroundings. Whether that be shells, the beach, the garden, my walks in the suburbs, something my daughter is doing or something I'm thinking and is lifting my spirit. I just love drawing ... Even it's just mixing colours on a page and then adding shapes to the splashes that are made. Looks like another wonderful class! I like to draw flowers. I also like to doodle (circles, flowers), and I really love to make scribbly marks! Animals and plain ol' doodles. I would love to win...I haven't taken an art class since 8th grade, and I'm 40! This looks like such a fun class! And I really need to get motivated to practice sketching more! I need to find more time for my art! I've been looking at this class for a while now. I've taken Summer Sketch and loved it! Me? I love to draw people...faces intrigue me!!!! My old house, my garden,my cat...so many wonderful things outside! I love to draw leaves and layer then on top of each other. Your classes are always inspiring. people i meet have to find their way into my sketchbook and flowers too!